The Micro-needling system : an ergonomic interface! 2in1 micro-perforation action and simultaneous serum diffusion. 200x higher absorption of product in the skin. Amplify the effectiveness of a serum, without pain! The evolution of the mechanism developed by Perform’Art makes it possible to perforate the skin without any damage. The quality and precision of the device ensures a better customer experience, without scars, and especially without pain. 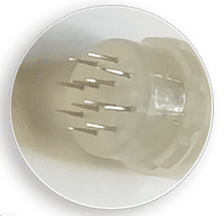 The Perform’Art technology that is in the Jouventude device allows us to infuse a serum into the perforation. More and more sought after, this technique exceeds the standards and also enables us to correct several skin abnormalities. The hand piece : another technological evolution of Perform’Art! 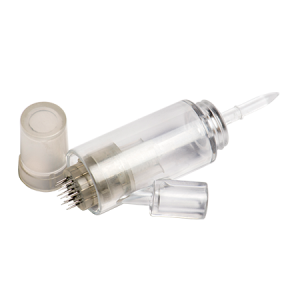 The hand-piece is composed of a needle unit, which receives the tube with the selected serum according to the desired treatment. The micro-needles have tiny holes to allow serum infusion during their insertion. With the settings marked on the handpiece, it allows us to choose the desired depth. The patented mechanism offers unprecedented precision; everything is in the accuracy of the needle movement, for a smooth insertion and removal, without damaging the skin. The mechanism of the needle is so precise that the procedures are performed without pain in the vast majority of cases, thus avoiding the need for anesthesia. Discover the Jouventude device in action. Discover our device designed for micro-needling treatments that allow serum infusion in the perforation. Discover our needle module that enables serum infusion, adapted for the Jouventude device. Designed with good chromatic stability for a lasting effect and compatible with our devices.